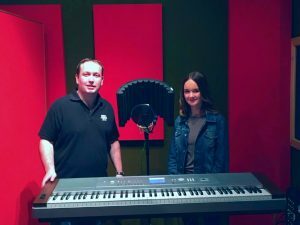 Today saw Song For MK winner Paige Broadhurst take to the studio to experience the dream of cutting her first released song. After a strong competitive process, 15 year old Paige was declared winner with her track ‘This is MK’, winning the opportunity to work with sponsors Unit Nine to record and release the track to raise money for the benefiting charities MK Dons Sport and Education Trust (SET) and Milton Keynes City Orchestra (MKCO). Runners-up included local songwriter John Hawkes who picked up an Acton Mini-Amp courtesy of partners Marshall Amplification, Dave Curran who picked up a trip to MK Dons and oldest competitor 95 year old Ron Groom who will be guest of the MKCO at their first concert of the new season. This now starts a journey for Paige who will not only be releasing her single shortly on I-Tunes, but will also be performing ‘This is MK’ as part of several events celebrating the 50th Birthday of Milton Keynes with the first confirmed performance at the Sporting Proms being held as part of the #SETturns10 week to Celebrate MK Dons SET’s 10th Birthday on 17th November at ArenaMK. Performances at Intu MK and other engagements around MK will be announced in due course. You can buy the single from the 1st November exclusively on I-Tunes. Events Managed would like to thank all our partners once again, Milton Keynes Council, Milton Keynes Dons Sport and Education Trust, Milton Keynes City Orchestra, Unit Nine, Marshall Amplification and Intu MK. For all enquiries regarding Song For MK, This is MK or performances please contact us.